Once upon a time a rabbit who lived in a jungle was proud about his speed. 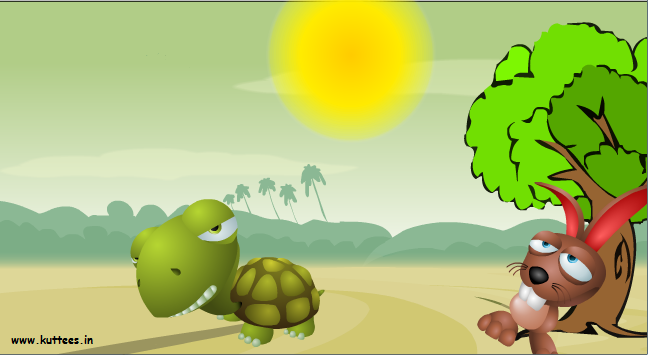 One day, he saw a tortoise walking very slowly. The rabbit started making fun at him for his slow walk. 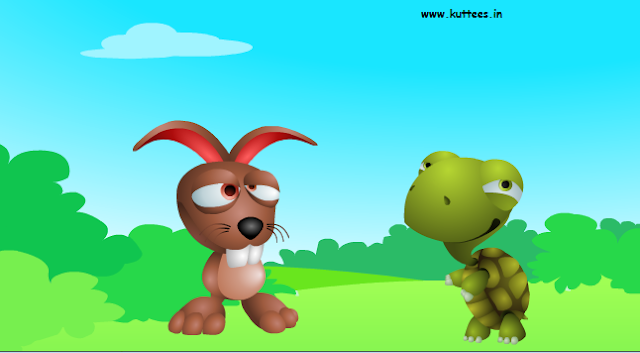 At one point, the tortoise felt very sad and challenged the rabbit for a race. The rabbit was happy to hear about the race. He agreed with a teasing smile. They both decided about the route for the race and the race began in few minutes. Just in few seconds, the rabbit ran very fast and off the sight. The poor tortoise walked very slowly. After running for sometime, the rabbit turned back to see if the tortoise was coming back. Tortoise was not seen anywhere near. Since it was a very hot day, soon the rabbit became very tired. He knew that the tortoise would be walking very slowly. So the rabbit decided to take some rest and then continue the race. He sat beneath a tree and closed his eyes. Very soon the rabbit had a deep sleep. The the tortoise was slow in the race, he walked steadily. He crossed the sleeping rabbit and reached the finish point, first. Thus the rabbit lost the race because of his over-confident.